Child Life Society provides vital assistance to children and adults with cystic fibrosis. Although cystic fibrosis remains incurable, extraordinary medical advances in recent years have helped ease the symptoms and provide hope. However, public awareness and resources remain low, and those suffering from this disease are frequently misunderstood and underserved. Child Life Society spreads information and provides desperately needed services to CF children and their families. Every dollar donated to Child Life Society helps fund valuable programs that completely change the daily lives of CF children. Ever since a study was published in the prestigious New England Journal of Medicine touting the benefits of a salty oceanic climate for cystic fibrosis patients, Child Life Society has worked to offer families the best opportunity to enjoy these benefits. After close consultation with various experts and physicians, Child Life Society settled on Key West, Florida – located on the southern tip of the state, near the Caribbean Islands – as the ideal location for its new Lifeshine Respite Program. Medical professional have reported that exercise is the best way for children with cystic fibrosis – who spend much of their time reacting to their disease with medication and therapy – to decrease shortness of breath, lessen muscle deterioration, and possibly add years to their lives. 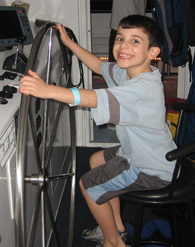 One venue in which children are able to obtain lots of exercise is at camp. Children with cystic fibrosis are generally underweight or undernourished. This weakens their immune system and makes them vulnerable for life-threatening lung infections. To strengthen their immune systems for a better chance to fight off infections, children with cystic fibrosis must take expensive food supplements on a daily basis. Maintaining a household while caring for a child with cystic fibrosis overwhelms even the most organized parents. Adding to the burden is the knowledge that a child with CF typically suffers less in fresh, dust free environments. The exorbitant cost of cystic fibrosis-related medication is generally covered by health insurance. But if a family exceeds their coverage, or if monthly co-payments for several children with cystic fibrosis becomes too much to bear, Child Life Society can help.